If the importance of crawling is a matter for some debate, the placing of babies in the prone position (on their tummies) is an even more controversial issue - some would say, a matter of life and death. The question is: does sleeping in the prone position put babies at greater risk for sudden infant death syndrome (SIDS), or crib death? According to some experts, yes - and the current wisdom is to always put babies to sleep on their backs. According to Glenn Doman, it is more natural for babies to sleep on their tummies. He adds that nighttime is an important time to make use of the prone position, as tiny babies actually belly crawl in their sleep. Which advice you choose to follow at bedtime is up to you. What seems clear however is that maximizing tummy time during the day can do no harm - and does indeed encourage the development of your baby's motor skills and muscle tone. Once in the prone position, your baby will instinctively lift his head (helping to develop his neck muscles), push up with his arms (helping to develop his arm and chest muscles) and push off the floor with his legs (helping to develop his leg and hip muscles). According to Doman, babies get bored when we place them on their backs and leave them to look at mobiles. What they really want is to explore the world - and putting them on their tummies gives them the opportunity to do this. Once in the prone position, a baby can see nearby objects and feels motivated to get over to them. Doman recommends that babies spend a minimum of four waking hours in the prone position - though that time can be divided into short increments. This is in addition to the time the baby will spend on her tummy while asleep. It is not uncommon for babies to hate tummy time - especially if they have not been placed in the prone position much since birth. Many parents report that their baby fusses or cries to be rescued - even when the baby was the one to turn onto his tummy in the first place! How you deal with this will come down to the degree of importance you place on developing mobility early, and how comfortable you are with letting your baby cry. Doman recommends that you get down on the floor with your baby. In this position, you can encourage and reassure him, even while refusing to pick him up. 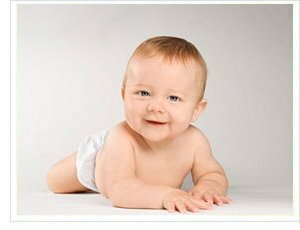 Pediatricians generally recommend regular tummy time - although the importance they place on it varies considerably. Some doctors point out that babies are not ready to crawl until they have developed the muscles needed to sit well unsupported. Babies don't usually cry out of a failure to do something, they say, but rather because the activity being asked of them is developmentally beyond their reach. However, the fact that babies can belly crawl from birth is well documented - and it is this instinctive if limited form of locomotion that usually leads to the most advanced type: rapid crawling on all fours in a cross pattern (where the right arm moves with the left leg, and vice versa). If you decide to follow Glenn Doman's advice, and can see out the difficult initial period, you should find that your baby stops fussing in the prone position. Indeed, once she has discovered the joys of mobility, she will probably prefer to be on her tummy than in any other position.